When getting to Staraya (Old) Ladoga, one immediately feels fascination of this place. Its aura makes you forget about the present. Staraya Ladoga is a unique country, no matter how you come to realize that - using your mind to imagine people who lived their lives here almost 1250 years ago or your senses to perceive the spirit of the place. Located at a scenery bend of the Volkhov River, Staraya Ladoga is 120 km far from St.Petersburg. 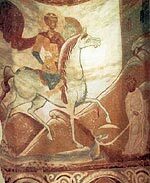 The ancient waterway "from the Varangians to the Greeks" that passed here made Staraya Ladoga a crossing point of the peoples and cultures to the benefit of its inhabitants. The relatively small territory of 190 hectares retains 160 monuments of the 8th -20th centuries. The museum founded in 1966 was opened for visitors in July 1971. The current status of the whole territory of the ancient town and its surroundings is a historic architectural and archeological reserve museum. More than 200 ths units are deposited in the museum funds, numerous fragments of destroyed murals being among them. Museum exhibits are arranged in nearly all monuments of the reserve. The archeological collection of the Staraya Ladoga museum is considered one of the most interesting ones of that kind in Russia. It has visited many European countries. The ethnographic exhibit includes belongings of peasants, petty bourgeoises, noble people and merchants and depicts the private life of different classes of Ladoga. The prevailing trades that brought income to local residents were quarrying, timber cutting, shipping, fishing, farriery and blacksmithing. Weaving, spinning and woodworking were also developed. More than 400 works, mostly landscape and genre paintings by remarkable Russian and Soviet artists who worked in Staraya Ladoga, are featured in the art collection of the reserve museum. Ten general and specialized tours are conducted in the reserve, including those of museum exhibits and shows and of architectural monuments, ancient churches and monastery ensembles. Concerts of classical and folk music are performed in the harmoniously proportioned Church of Sv.Georgy (St.George) of the 12th century. 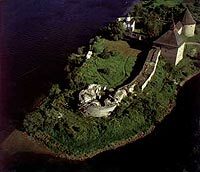 The Ladoga fortress houses the yearly "Wreath of Glory" festival on the second Sunday of July.